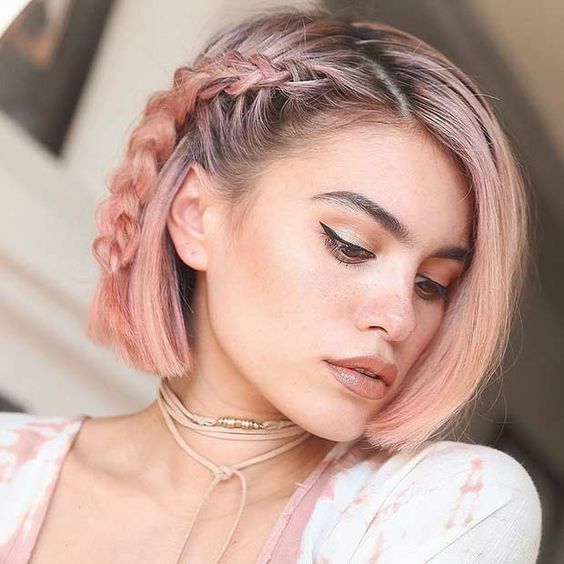 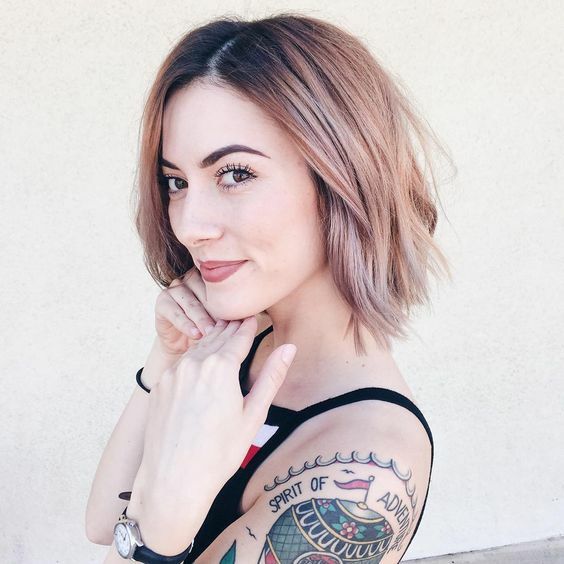 If you’re looking to wear a hair color trend that’s more daring than blonde balayage but more feminine than granny grey, rose gold hair color should be your next style adventure. 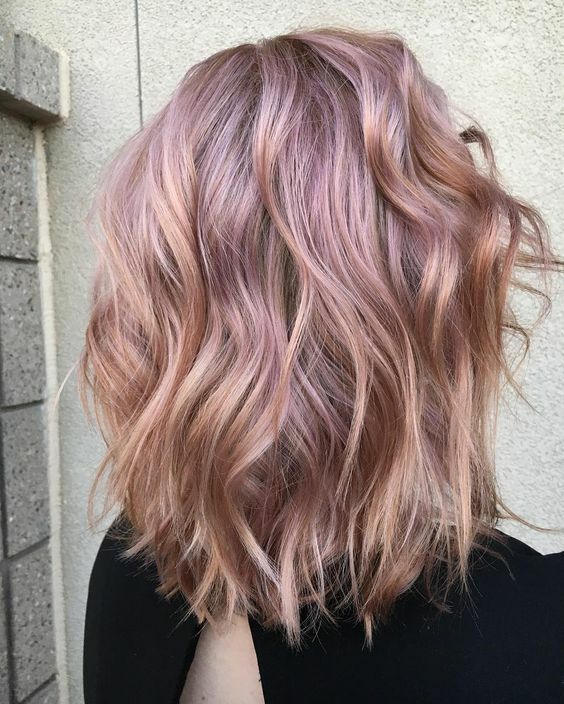 No longer just for jewelry and iPhone cases, rose gold hair is a stand-out choice for anyone who’s dying to try something bright and new. Rose gold color is stunning from root to tip, or you can use it to highlight your existing shade. 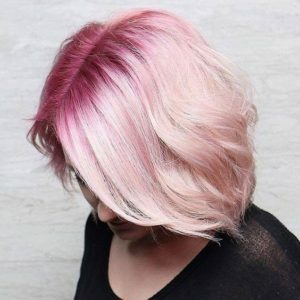 Whether you opt for a light, pearlescent color or a deeper blush tone, this trend pairs perfectly with warm weather outfits and sun-kissed skin. Our favorite rose gold hair color styles are sparkling, brilliant, and waiting for you to try them on. 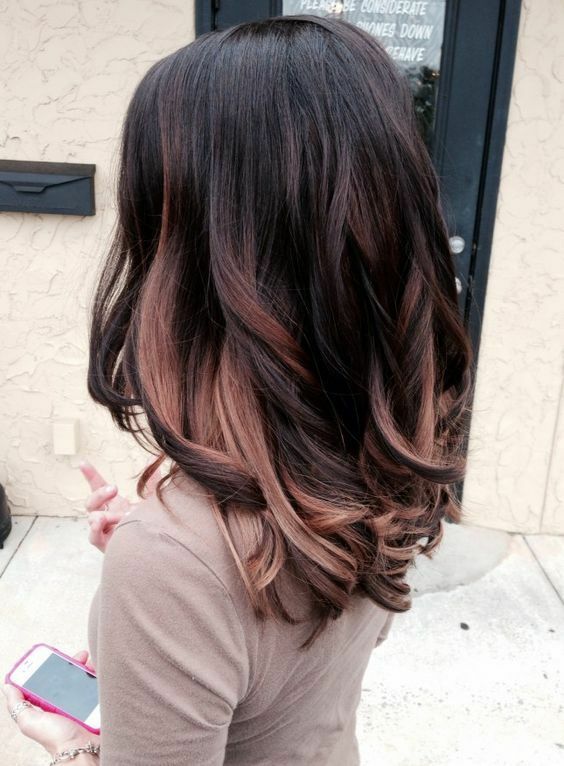 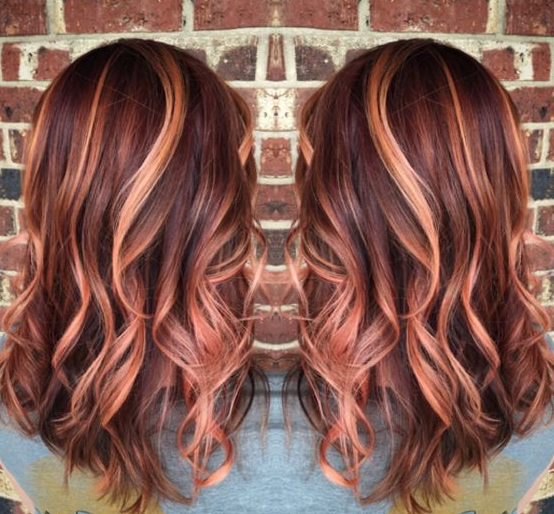 Subtle rose gold balayage provides a stunning contrast to long, espresso locks. 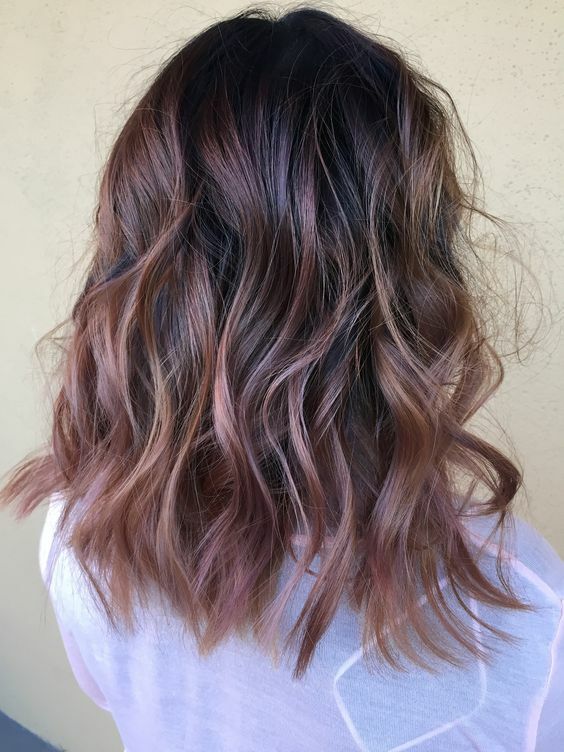 Use this technique to try out a touch of rose gold on your dark brown hair. The finished style looks like a decadent chocolate raspberry pastry that you’ll be clamouring to get more of. 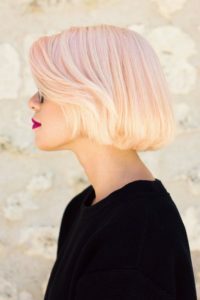 This light rose gold hair color style is a pink-tinged champagne blonde that’s perfect for existing blondes who want to add a little more drama to their hairstyle. 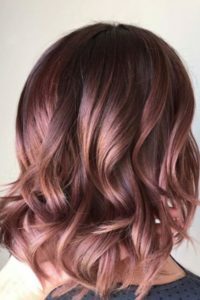 Featuring subtle purple and pink highlights, this medium brown hair shines in delicious shades of raspberry and rose gold, but won’t look like a bold pink hairstyle in dim or indoor lighting. 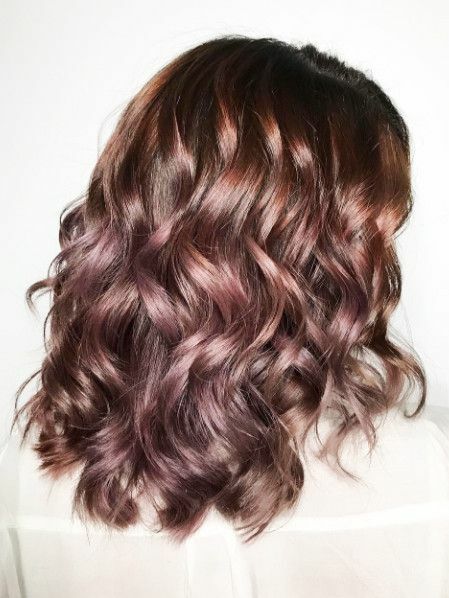 Rose gold hair color really pops against an exposed brown or dark blonde root, but this magenta shadow root takes things to a much more vibrant extreme. 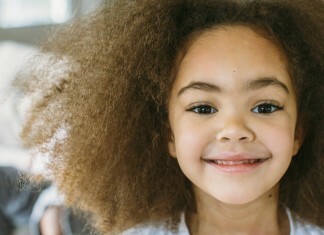 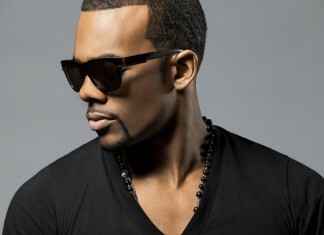 This style will obviously require frequent upkeep, and natural blondes will probably find it the easiest to maintain. 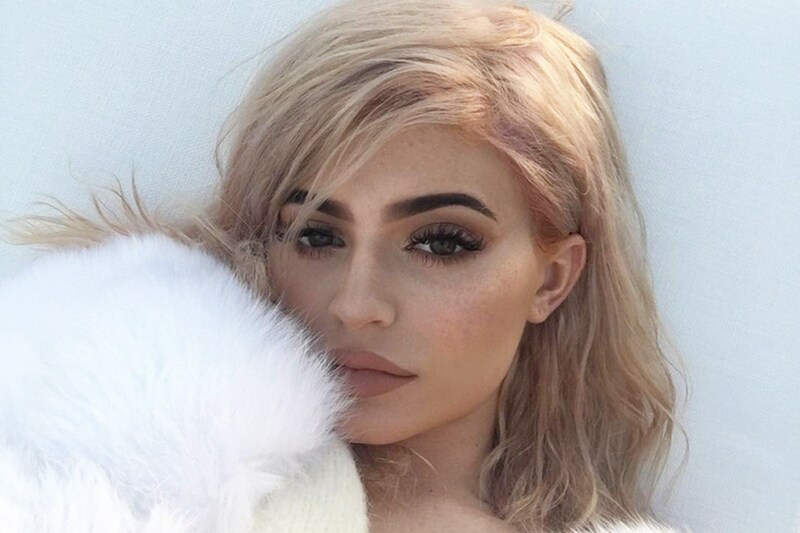 This gorgeous shade of deep blush rose is perfect for anyone who wants to get in on this trend without going for a traditional blonde hairstyle. 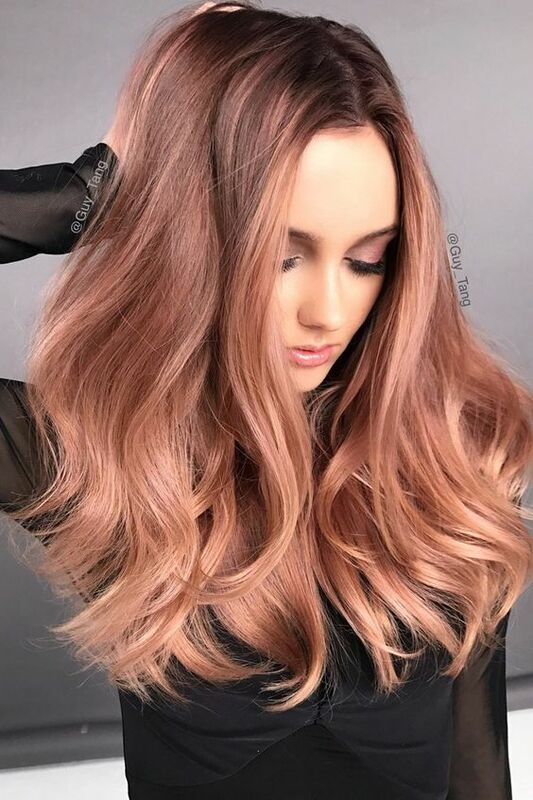 With a subtle rose gold shade distributed throughout the middle and underneath layers of hair, this balayage style looks natural and modern when combined with pale blonde hair and a dark exposed root. This rose gold shade has some cool, almost purple tones that make it a nice option for women with cool toned skin who aren’t sure about pulling off a truly pink shade. This rose gold hair color style features a subtle transition between champagne blonde roots and a light blush pink shade on the ends. 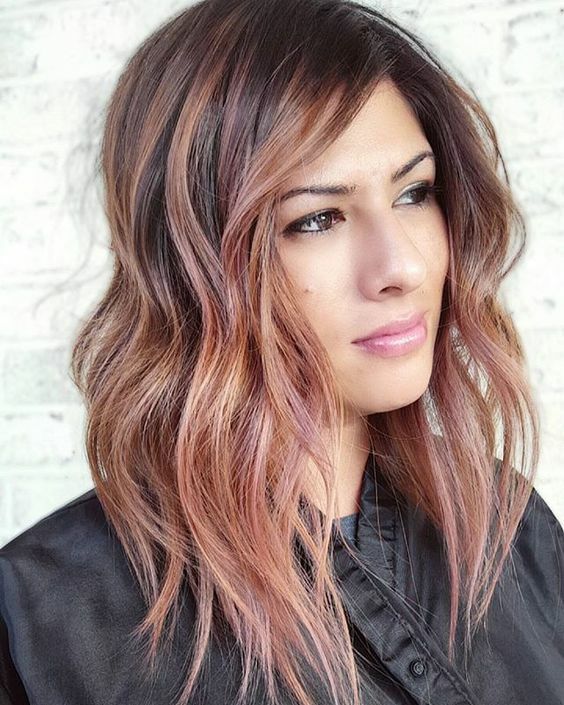 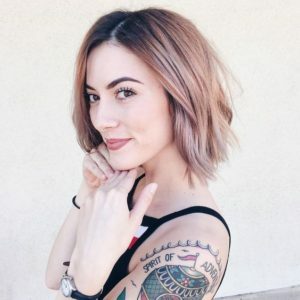 With blush rose gold highlights concentrated around the face, this hair color has maximum effect in highlighting this trendy mid-length haircut. 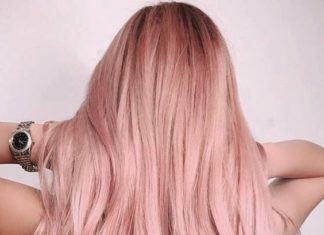 This warm, but not too-light shade of rose gold perfectly compliments olive toned skin that could look yellowy up against a pure blonde shade. 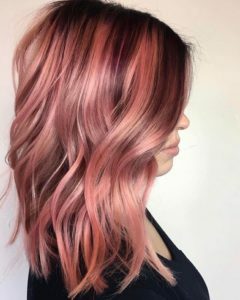 Featuring a vibrant pink shade at the roots and a lighter rose gold color toward the ends, this rose gold hairstyle is an all-over pink look that’s still full of dimension. 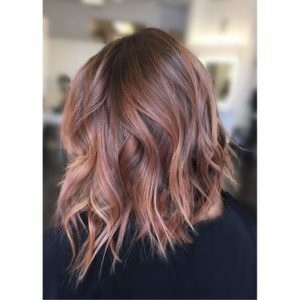 Wearing a full head of warm rose gold hair color offers up an incredibly subtle way to try out this hair trend. 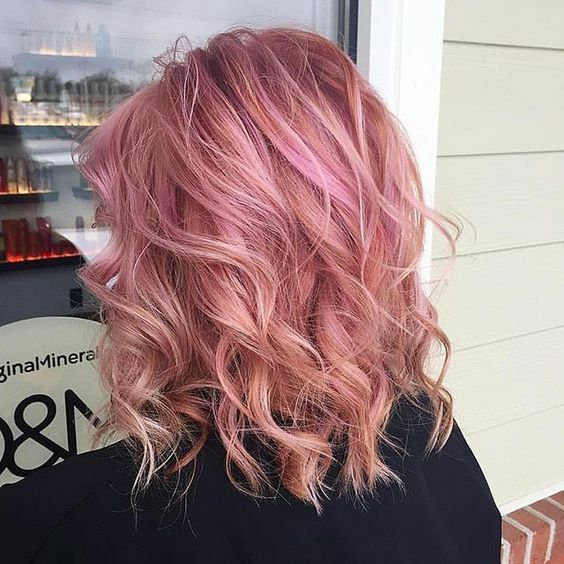 If you’re already blonde, warming up your color with this rosy hue will bring you a cascade of compliments without completely changing up your look. Modern, trendy, and totally Instagram worthy, this dusty shade of cool rose gold shows how rich and luxurious this hair trend can be. Featuring a warmer shade with hints of orange, these rose gold highlights make a stunning contrast against an auburn base color without looking completely out of place. Sporadically placed highlights begin farther up on the head than with a balayage or ombre technique, meaning you’ll need more frequent touch ups to maintain this look. 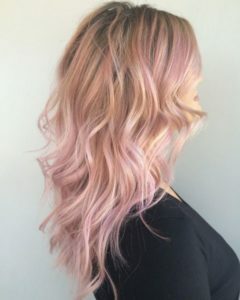 With a mixture of both cool purple-tinged and warm pinkish rose gold shades, this look is best suited to women with neutral undertones in their skin. 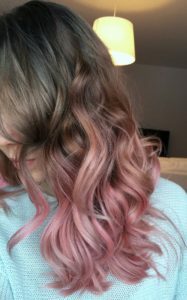 This blush rose gold shade against a medium brunette base color is an ideal hybrid of natural and crazy vibrant ombre styles. 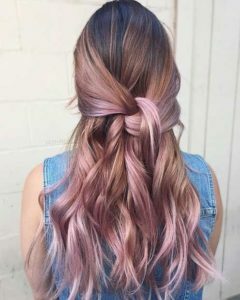 If you’re looking for something unique and eye-catching that will still look feminine and chic at a wedding, this is the perfect ombre style for you. 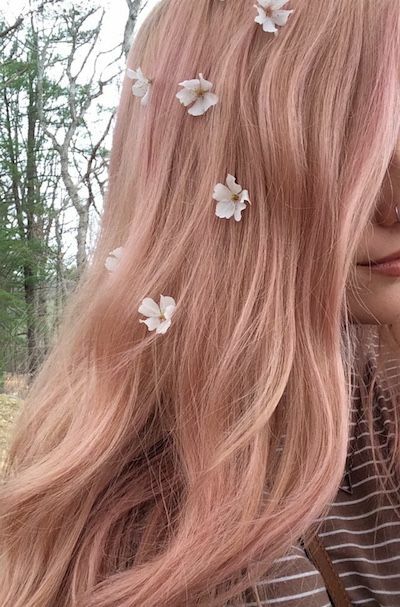 Getting naturally dark hair to a rose gold shade can take a lot of lightening work. 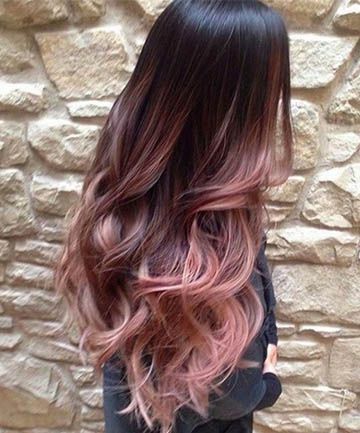 For ladies with super long locks, this can mean hours spent sitting in a salon chair. 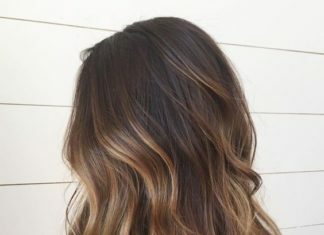 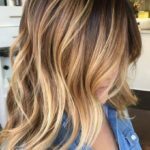 This balayage style offers up maximum effect by concentrating its color towards the front of hair, but will save you time both in the initial coloring and subsequent upkeep. Give your pearly blonde hair a chic touch-up with this rose-tinged shine. 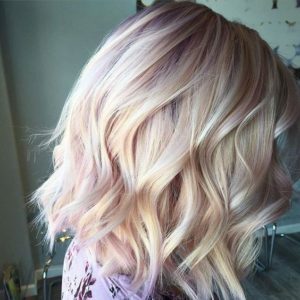 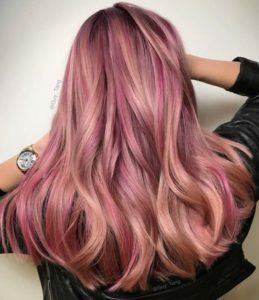 Subtle placement of pinkish highlights make this style look dreamy and luxurious, offering up the perfect color option for ladies who like to stay sophisticated and on trend. A cool rose gold shade can breathe new life into your dark brown hair color, but might not be an ideal match against your skin tone. 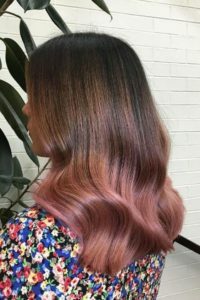 Using an ombre technique allows you to avoid a pink shade right up against your face, and makes the growing-out process a breeze. 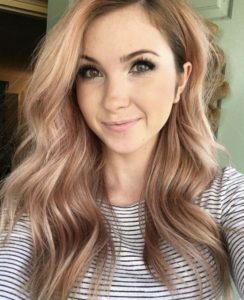 This pastel rose gold hair color verges more towards being a true pink shade, and balances nicely against darker roots to create extra depth and dimension. Rose gold highlights in a wide range of shades create an extra high-contrast highlight against this dark brunette base color. 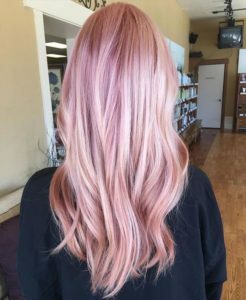 This is one rose gold hair color style that won’t let you blend into the crowd. 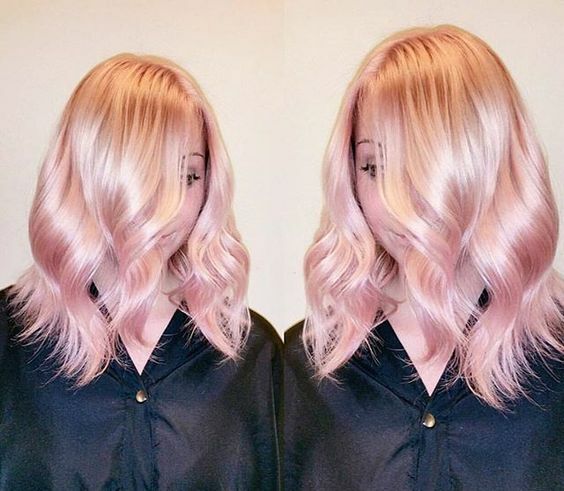 Subtle touches of rose gold underneath a very pale blonde base color act as lowlights to bring some darker depth and dimension to this bob while keeping the hairstyle looking ultra feminine. 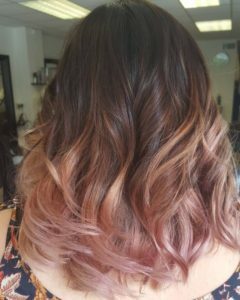 Blush rose ombre can completely makeover your brunette hair while still leaving natural roots untouched. 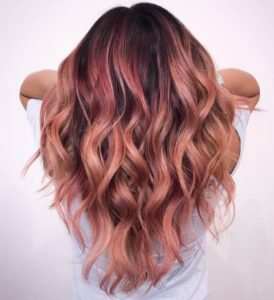 If you’re looking to test out the shade before going for an all-over style, make this rose gold ombre your summertime hair experiment. 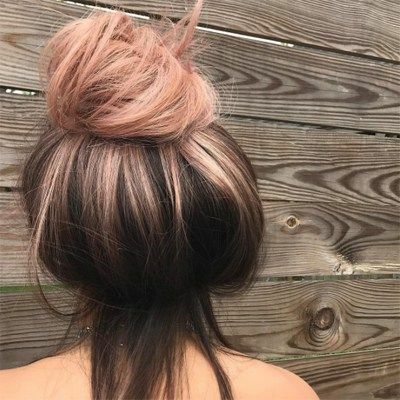 There are lots of variations on the rose gold shade, but this style keeps things pretty close to the true color of a piece of rose gold jewelry. 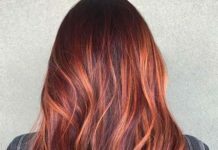 Brilliant, sparkling, and super-feminine, this is the ultimate springtime hair color for ladies who are loving this trend. 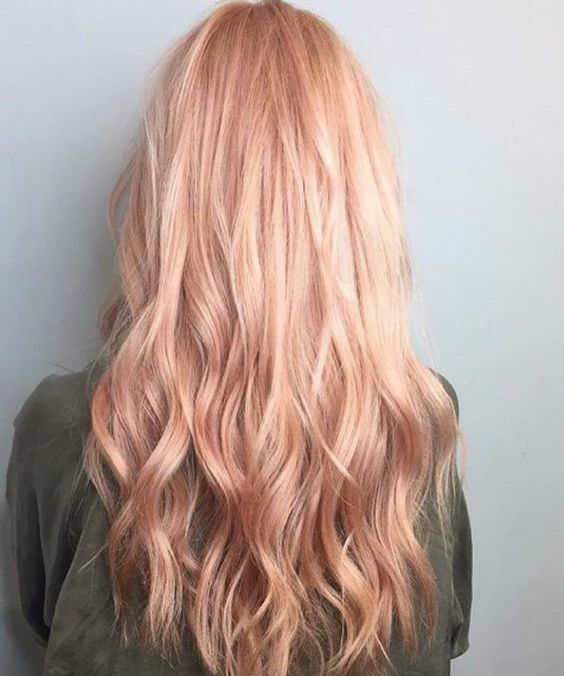 A seamless transition from darker rose roots to a warm blush shade and finally blonde ends, this rose gold color melt uses an expert technique to give you all the colors you could want. 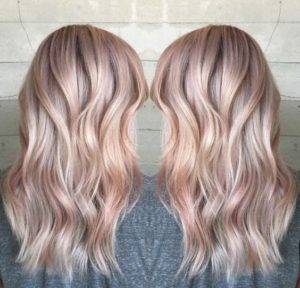 This light, pearly rose gold hair color is an incredibly feminine take on this jewelry-inspired hair trend. 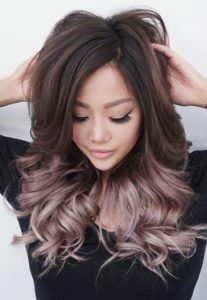 Leaving darker roots allows for a bit of balance and will make it easier for you to grow out this color. 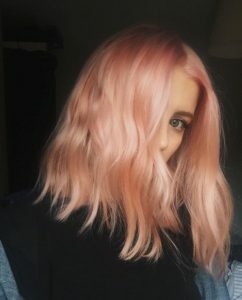 Although most rose gold hair colors look like they were made for spring and summer, this deep blush shade is rich enough to make a nice fall or winter color. Keep your natural dark brown roots to ground this burnished rose gold hue. 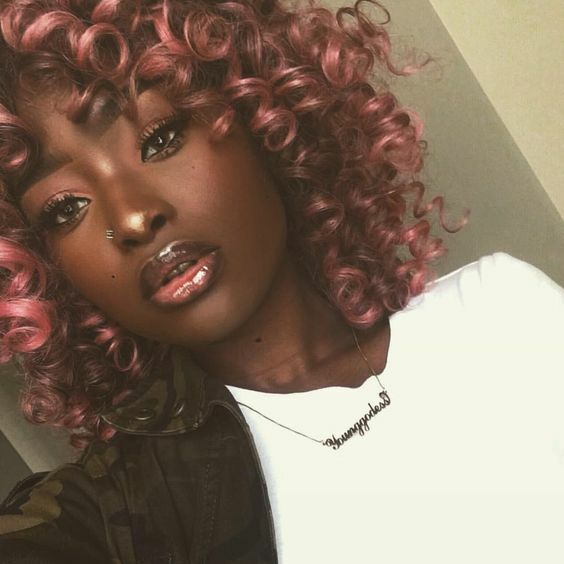 Light to medium skinned ladies with warm undertones will love how this warm rose gold color makes their blush and lip color pop. 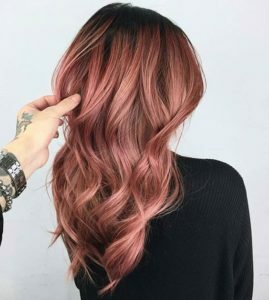 This darker rose gold shade makes the perfect accent to medium brown hair, looking surprisingly natural thanks to its sparing color application and expert blending. 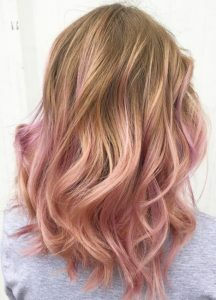 Coming close a true pink hairstyle, there are still hints of blonde visible in this rosy pink hairstyle. Both porcelain and medium complexions can pull off this color, while women with olive or deep skin tones might want to opt for a richer rose gold shade. 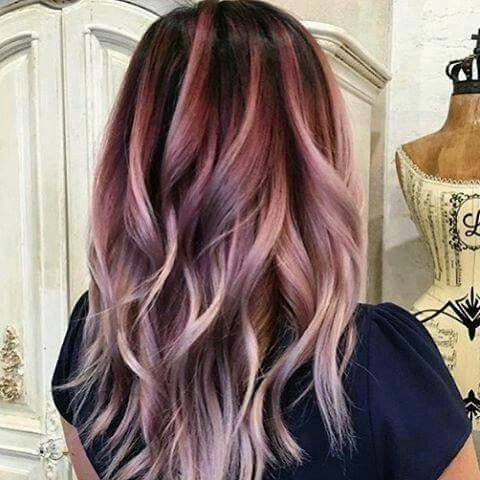 This color style takes some risks by mixing a cool shade of purplish rose with warmer blonde and brunette tones in the hair’s base color. 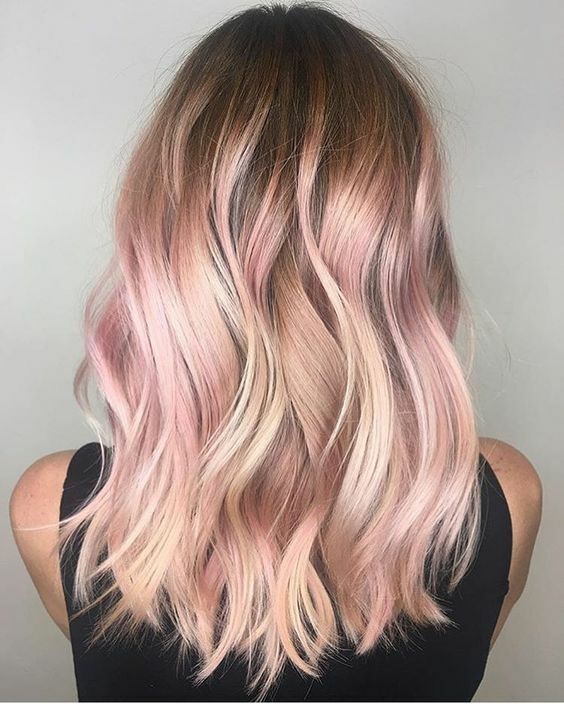 Ladies with neutral undertones will have the best luck pulling off this color palette, especially in spring and summer when everyone is mixing patterns and colors. This color style features a lovely shade of blush pink over a warm medium blonde base color. The resulting style has a fun, more temporary look that’s perfect for a spring or summer color upgrade chosen on a whim. With subtle rose gold highlights that have hints of peach in them, this is the perfect rose gold style to wear over your natural brown or auburn hair. 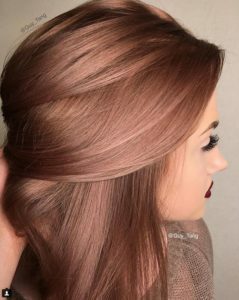 If you want your hair to look as rich as your rose gold accessories, try this luxurious hair color style. From dark brown roots to deep blush ends, this rose gold color melt features a gentle gradient that makes this pink-tinged hairstyle look surprisingly natural. 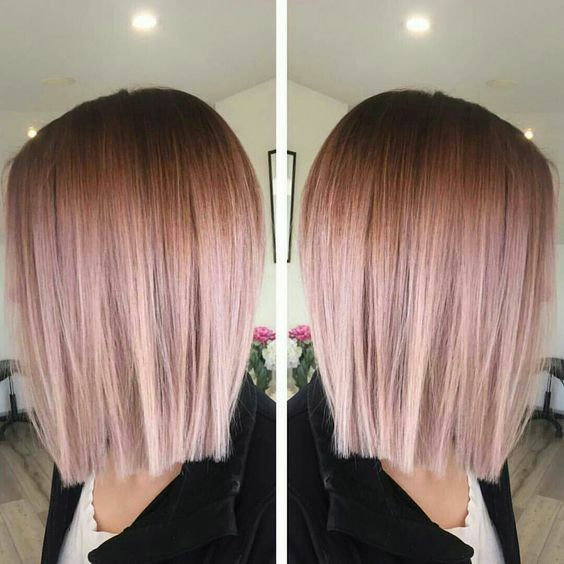 A pale platinum bob with a touch of pink highlighting makes for a subtle way to get a pretty rose gold hair color this summer. You cannot go wrong with this rich multidimensional rose gold shade! 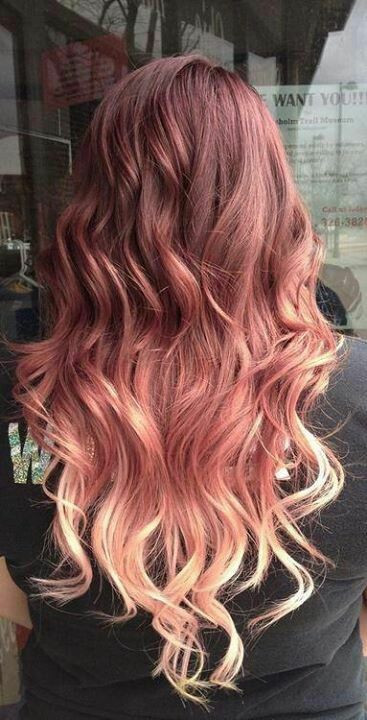 If you have a brown base color, rose gold would look amazing on your hair! 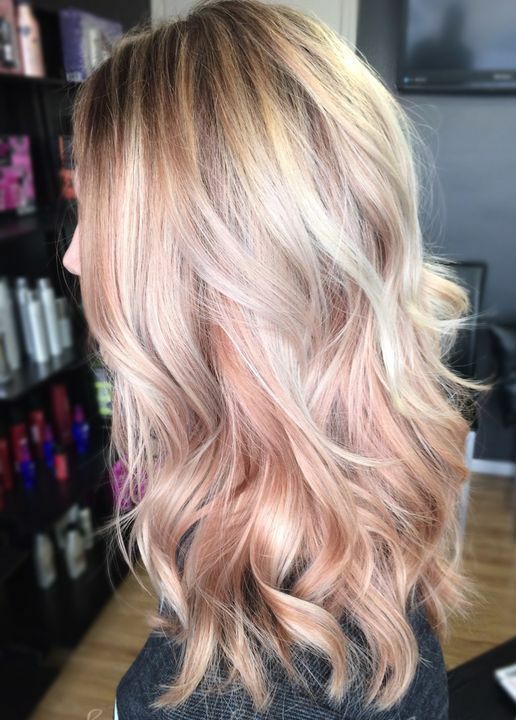 Adding rose gold lowlights is a great way to add dimension and brilliance to your blonde hair. We love this balayage style with shadowy roots and the bright pink highlight which give a pop of color to her hair. Not a fan of bright pink? This is a beautiful and subtle metallic rose gold balayage with darker roots. We are in love with this mix of light sandy blonde and sunkissed rose gold sades. 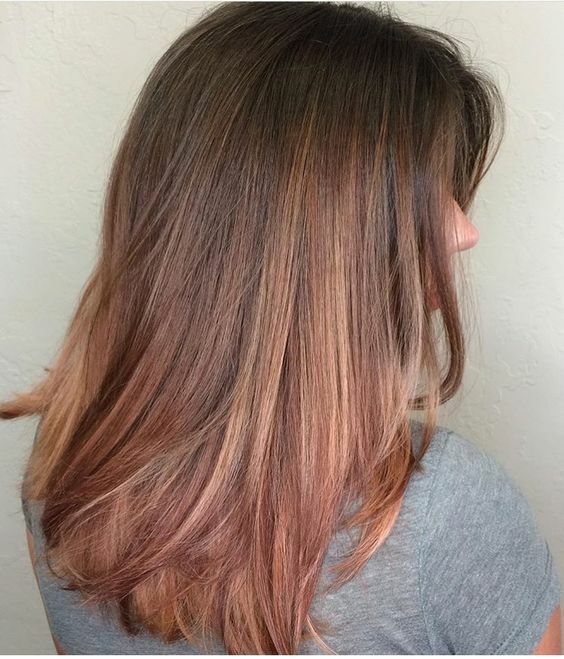 Another stunning subtle baby pink rose gold highlights on blonde hair. If pink is your color, you can spice up your balayage by mixing a few pink shades like this fuchsia and rose gold. Wine and rose gold are both hot and trendy and their combination creates a gorgeous multi-dimensional look! 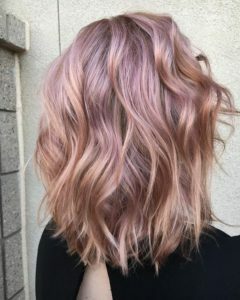 Rose gold is THE color trend for spring time! 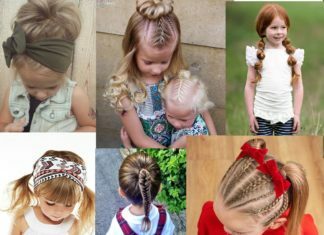 Spice it up by adding flowers or pins to your hair. 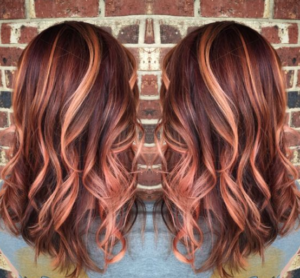 This stunning rose gold melton brown hair creates a flawless melted effect! This beautiful rose gold shade is subtle and blended beautifully!